Late January 1960 the Daily Express newspaper published a small advert in the inside pages, THE BILLY BUTLIN, the soon to be knighted “Sir Billy Butlin”,JOHN O’ GROATS TO LANDS END 1,000MILE FOOTRACE.Informing Males / Females could enter for the cost of £5 pounds. Further details where to follow, regarding the event. Over and over I read the advert, my imagination and interest growing each time I read the article. Extra notifications released in the press, Prize Monies amounting to mouth-watering sums to successful Male / Female completing the 1,000miles in the shortest period of time.Caravans at strategic points were to supply food and drink to competitors out on the road. Also, random unmarked checkpoints to be used, to monitor peoples progress on a daily, nightly system.Accepted entries would receive a passport (diary) with a route map, and present-day photograph in a folder, and a Billy Butlin Race Number, also a signed photo of Sir Billy Butlin and Gus Britton the famous English Channel Swimmer. Visiting my local branch at TSB Bank, I withdrew a large white £5-pound note, and in my very best hand writing corresponded with the Daily Express concerning the event. Continuing with my employment nothing changed. No one was aware of my curiosity and interest. Silliness and ridicule would have been thrown at me on a regular basis. So, I went about daily life as normal giving nothing away. Employed as a miner working underground, made me appreciate countryside, the different changing seasons, sunshine, rain, snow, wind, hail, cloud, all things you are deprived of underground. From early 1956 up to the harsh winter of 1960, many many miles I had covered on foot, embracing areas of West Lancashire, after finishing my daily shift. After showering at the pit baths, I would run home 3 miles, have a brew and 2 hours sleep, and away out into a 4-hour journey, selecting different routes on a 5 days rota, getting to be familiar with red telephone boxes, and tea shops and places to shelter in very inclement weather. Completing this regular schedule gave me a good basis and reasonable fitness to look elsewhere for targets. Friends from work were into football, of which I joined, and, also public bars and dance halls.Having frequented bars and halls to be sociable, very quickly I refrained from the regular appearance at these establishments, finding them repetitive and in some way false and boring, although I did enjoy dressing up in a smart suit, shirt, tie, and shiny shoes, at weekends, I felt alive and smart after wearing dirty, dusty clothes down the mine. Some weekends I would hitch-hike as far as I could, always being home for Sunday evening, ready for work on Monday. This hobby gave me a chance to see other counties, each one different, memorising each one for reference. Realising it could be dangerous, I took precautions beforehand and stood rigidly to my own set of rules. However, after a relatively trouble-free set of weekends, I set off in a Southerly direction arriving South of Worcester, walking, jogging, running, hitching I felt good no problems and a fair distance covered. On my return home weather deteriorated into very heavy rain and high winds, I buttoned up and hoped for a lift. None came my way over many miles. I persevered into the night accepting small lifts, and pressing on into a strong east cold wind and rain. Drenched and weary I accepted a lift in South Cheshire. It was a bad move, driver was heading North, which was good I thought but something was not quite right. I remained quiet, and answered his questions and conversation politely. Shivering with cold I knew I had to get out of the vehicle quickly. North of Warrington, his driving became erratic, steering with one hand on the wheel. Atmosphere inside the car was not good and I needed out fast. Spontaneously I requested urgent toilet. Request was ignored. Urging him again to halt. Moments later he stopped the car. I opened the door and ran for my life. Conveniently a canal towpath was nearby which I used to get off the road. Following the canal to the next overhead bridge. Next problem was navigation, although much more minor than my car escapade,I was confused on my whereabouts, no was one visible, no signs, nothing to give me any indication. Still cold and wet, Iwas overjoyed to meet an early rising milkman on his rounds, who gave me a welcome lift to the first “A” road. Relieved, I thanked him kindly. Now I was 18 miles from home. I ran, walked, jogged, most of the distance, with small lifts, arriving home in a tired wet disturbed state. I ate my meal and retired to bed with a promise to myself, never again, and I never did. By now I was wondering about my entry to the Daily Express. Weeks and weeks went by, doubts arose. Was I too young or was there something else?. I put it out of my mind, it was not to be. Shortly, however a letter arrived, I was accepted. I was thrilled, and confused, what had I done, signed up for a 1,000mile race, what an exciting crazy venture. Having 6 weeks to prepare to the start date, I visited my local garage to buy2 maps, Esso and Bartholomew, on Scotland and England, which gave me adequate information on the route we would use (from John O’ Groats to Land’s End). Although I did not know two large detours would be put in place en route. By now the local press covered stories about persons in the area who had entered the 1,000mile. Two local prominent sports stars were signed up. This was to get me out of the stories for now, and I was able to get on with normal procedure, which I really appreciated at the time. A date was set for start of the 1,000miles, February 22nd, 1960, at 5pm from John O’ Groats Hotel car park, on the narrow “B” road on the Friday evening in the extreme Northerly point of the Caithness County and Scotland. Early indications promised over 1,300 competitors from the UK and overseas. The weather forecast was causing big concern for the Procurator Fiscal. Heavy snow, and high winds hit the East coast of Caithness very hard indeed. Snow ploughs working overtime piling the drifting snow alongside the narrow, winding, coastal roads. Up to 4 feet in places, only cleared daily to keep the highways open. Meetings were held by County officials to investigate the sanity of allowing the unique event to get off the ground, never mind start. The uncertainty was unclear until the week before. A keen biting frosty wind stabilised the lengthy snowdrifts, allowing Council workers to clear the highway to acceptable levels. By now news had leaked out I was competing, and wrongly reported I was the youngest man.Everything from that period was difficult. Home, work, friends, all had questions, mostly WHY !!!!. Fortunately, I was only 7 days away from leaving for Scotland, but it became a mental trial fending off so many enquiries, some constructive, most plain unprintable, although I did hint jealousy was in some of the scathing comments. Parents and family obviously were confused about my venture, but mainly supportive, quite comforting as employment was king to our family, as it was in many many communities. A wage earner down on a Friday of a weekly budget, was major to any household. Our house was no different than any other. Previously I had pulled my weight, budget wise, and I could understand family concern, but I was determined to go and get the job done, whatever weather forecasters preached doom and gloom. As the day for departure came, after many fitful sleeps, the mood became more acceptable. OK, it was different, and hard work for most to get to grips with, I could agree with that, but people mellowed, wishing me a safe journey. I was on my way. Wednesday late afternoon February 18th I boarded the local bus to the main line railway station. On Tuesday I went to my local Bank to empty my Savings Book. £28 pounds I withdrew leaving shillings and pennies to stay in credit. Would it be sufficient, who knows, it just had to be, no doubt! Ticket officer asked me “where to”, at the train station “Wick, Caithness, Scotland, single please “. Officer said “change at Central Glasgow, for Buchanan Street, Glasgow, change at Inverness for Wick – £5 pounds please”. I gave him a large white fiver, only the second one I had seen, and thanked him for his navigational knowledge, which I thought was commendable, being that he never looked at a map nor information booklet. He smiled and said “it’s a long way son, keep warm and buttoned up well “. I was shocked, but humble someone had taken interest in my journey, with such obvious interest. Platform 2, I awaited the 4.15pm to Glasgow Central. Darkness was rapidly falling. Soon, I heard the steam train arriving, “The Green Howards”, a magnificent main-line engine. Quickly boarding I placed my rucksack in the overhead compartment, and settled in my seat, in my corridor carriage, with only one gentleman for company. Peering out of the window, I attempted to read stations we passed, only the major ones made any sense. 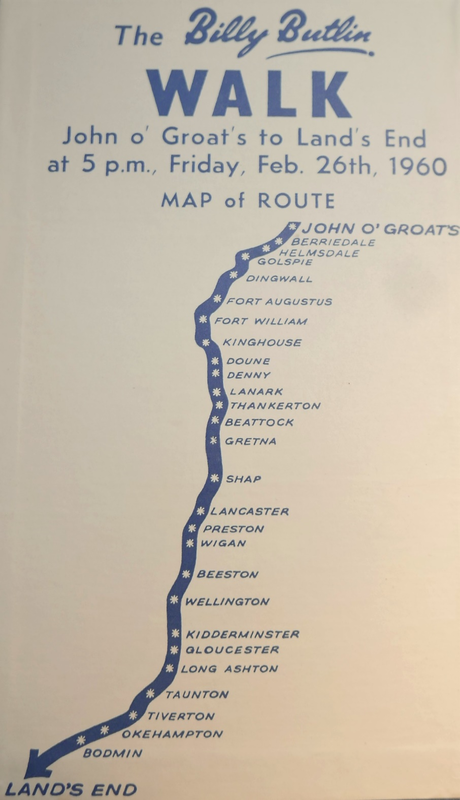 Large distances, were completed in total darkness, until my companion remarked “next station Carlisle, yougoingfar”,“Glasgow”, I replied, and he was off. Having the luxury of my own compartment I spread out and dozed off. “Tickets please”, the Train Conductor said in a truly Scottish twane, “OK there you go sir” showing my single ticket to Wick. He studied it, looked at me, “are you OK son, it’s a fair walk, you know”. I explained I was competitor number 7, and showed him my diary and passport, and thanked him for his interest. “Some people I have seen further down the train say what they are going to do, and what they will do it timewise, personally I doubt it, but good luck son, you know to change at Glasgow”. “Yes, thank you” and he went about his ticket collecting. The steel lights of Paisley shone brightly before arriving at the massive grand station of Glasgow Central. So, farewell to “The Green Howards”. Passing through the ticket barrier, a strange thought came to mind, many many Soldiers, Airmen, Sailors, had departed from this historical busy station, to serve their country, in many wars. My task became trivial, compared to so much sacrifice. Outside Central Station I was lost, having to make a further connection, I contacted a Scottish Policeman for directions to Buchanan Street Station, which he clearly demonstrated to me perfectly, then touching his helmet “all the very best sonny, hope the weather gets more kinder to you “. I appreciated his manner, and proceeded on my way. Finding Buchanan Street Station as directed, looking at the departure screen, names of place with great Scottish history, mentioned in abundance lit up the departure board, so near yet so far away. I was informed platform 2 was mine, and already awaiting passengers. Having a little time to spare I followed the carriages to the massive steam train to take us to Inverness, “The Gordon Highlander”. “Hello son” a rough overalled man on the steam engine “are you going all the way to Inverness”.“Yes” I replied, “will need a double header most of the journey, reason of snow drifts on line”. “Is it normal practice” I enquired. “February been a bad month, beware of long delays”. “OK”, I replied “patience a virtue”, laughing he said, “you will need plenty of that if you are going to Wick from Inverness, get aboard we are ready to go”. Unlike earlier the train this was quite full, so I contented myself in the first available seat. A little cramped, but at least a space to rest myself in. Noisily the Highlander chugged out of Buchanan Street Station, into complete darkness, on its way to the capital of the Scottish Highlands. Soon banter and coughing filled the carriage. Topic being the weather far North, and the possible effects on our journey, interspersed with the Sir Billy Butlin 1,000miles event. Tiredness, coupled with blanket darkness sent me to an uncomfortable doze. How long this state lasted I can only guess, until we shuddered to an almighty stop. “Big Betty” was to be coupled up to get us through the remainder of the night time winter journey. Peering through steamy windows, although pitch black outside, I could make out silhouettes of snow covered fields, going on and on. Banter and coughing, with frequent loud laughter were still in full flow. Whatever happened to sleeping in the wee hours, most annoying. “Betty” and “Gordon” pressed on through the hours. The power of two engines reverberating through our front carriage, only to stop now and again for oversized drifts of snow. Daylight crept on the white covered countryside. A welcome relief, hedge, fences, were buried, tree tops stood out under thick blankets of snow. No roads visible. Around 6am houses appeared, outskirts of Inverness, soon to be in the Highlands Capital Railway Station. On arrival, Murdo and Robert, the overalled men, the two train drivers, stepped down onto the platform. I wanted to show my appreciation for their night time vigilance. Murdo immediately said “Molly in the waiting room café will serve you a mug of tea, bowl of broth. Get it in Son, time is precious in winter, your connection to Wick will soon depart”. Hurriedly I obeyed his kind request. Sure, enough Molly provided me with a curious early breakfast of tea and broth. I realised it was the first money I had parted with since starting my journey at 4:15pm over 14 hours ago. It was very nourishing and warming. 6:45am the whistle sounded on two large black steam engines, complete with massive yellow snowplough. I boarded the train, conveniently not too full, as the last one. Off we went, many service stations potted along the route, which I found to a source of interest on my Esso map. Again, the journey was slow but steady, with not many passengers alighting or boarding. The winter February month must have deterred people from travelling. However, oneparticularstop, at Georgeman’s Junction where carriages split to Thurso and Wick, was novel. The signalman climbed up into one of the black steam engines, with a brew can, and half a loaf of bread. 30 minutes later complete with brew can and slices of toast, he entered his signal box and waved goodbye to the black steam engines drivers. Off we chugged on our last leg, finally coming into Wick at 1:30pm, a full eventful 21hours of patience and experience. I thanked both train drivers, which they kindly acknowledged. Now I was on foreign territory, manners and courtesy were of great importance. Number one priority was accommodation for the evening. Easier said than done, all regular establishments were booked up in advance, one by one 1,000mile competitors, and two by Nordic fishermen, who had landed in port, with their produce to be sent around the country, by rail and road. Soon darkness covered the town, still no signs of a place to sleep. The Gold Sovereign, the local pub looked inviting as the weather went cold and frosty. Not being a drinking man, I went in quietly and remained stood alongside the bar. No one spoke to me, no one seemed to bother, suddenly Jimmy Landlord came up to me and asked for ID. I showed my race number, passport, diary, “well son you don’t look old enough, but if you are to take on the challenge, what do you want to drink”. Previously I studied other men’s habits “half of eighty shillings and half of black label”. A smile came on his face “OK Son coming up “. That drink lasted a lifetime. About maybe 2 hours later, Jimmy asked “everything OK Son”, still the same drink in front of me. I asked did he knew of any accommodation in Wick. Again, he smiled, “why did n’t you ask me when you came in at first, of course “ he said, “Maggie Sinclair, 7 Atlantic Row, tell her Jimmy sent you”. I gulped both drinks down quick style, thanked him kindly and departed the busy establishment. 7 Atlantic Row, next to the quayside was a small terrace, with huge stone bricks, well pointed, made for harsh winters, and the Atlantic sea storms. Maggie, Mrs Sinclair, opened the door, “well have you come far” she said, “around 500miles by train”, “better come in then, and shut the door”. A typical old- fashioned Grandma, with straight to the point conversation, no frills. “you will sleep on the sofa, I will keep the fire going all night, stoke it up if it goes low”. Her two large newfoundland dogs, Busby and Baxter stretched out on the sofa, and in front of the black range, with no deference. Also, I saw an abundance of pegged rugs, all over the cosy, tiny, living room. Winter months of work paid warm dividends. “well” Maggie said, “tell me the story, why you came up to the frozen North to do this thing”. A pot of tea, 2 cups, milk, sugar and 2 pancakes with honey on, sat on the small table between our small fireside chairs. “what did Mum have to say before you left home”. I told her much of what happened, and that Mum had requested a postcard of every County I completed in Scotland and England. “I will start you off Son, I am visiting Wick Post Office today. They sell North Caithness postcards”. So, after my story I asked about the house history. “been in family Sinclair for ages, I have lived here all my life. Seen many storms at sea, before yonder sea wall was built to save us heartache from the Atlantic Ocean, fair bad it was, no protection from monster waves lashing the whole area. wellington boots, sou’westers, rain clothes, did a good trade, if nothing else did. Umbrellas were useless, blown inside out in no time. Fire was always burning keeping clothes dry, and the house warm. Same as today. I make a living by housing Nordic, and Scandinavian fishermen, when they dock in port. They pay well, if a rowdy bunch of seafarers after a drink or two in “The Sov”.” She paused “by the way 6 of them will return after closing time at the pub, usually singing native Country songs, but they soon go to sleep and snore like pigs. Breakfast is early, tea, toast and porridge. Usually they clear table and wash up for me, to leave me on my own, to have a quite period. Oh! how are you getting to Wick for 5pm “. I had neglected this, “well! I don’t know”, I replied. “Austin has a timber wagon, usually goes up to Hotel about 3pm, if you are ready for 2:30, you can get a lift on the wagon”, Maggie said, “don’t be late”. So, after a stroll around the dramatic quayside, battered by the sea spray and howling East wind, watching trawlers bob up and down, lashed to the impressive sea wall, which gave much safety to a vulnerable Scottish port in the face of Atlantic gales, I checked my gear, in a sheltered alley way, all present and correct, making my way back to Maggie Sinclair’s house, I saw Austin’s timber wagon outside the terraced house. Loads of brown hessian bags were neatly placed on of wagon. “Hullo Son”, greeted Austin “Ready for the off”, “yes Sir”, I replied. Austin told me he had to fill up with petrol at a garage 2miles South of the town, get in off we go. Penny the owner of the garage was a lovely lady enquiring about the 1,000miles event in detail. “You will pass our place on way down, leave your rucksack here, it will be safe, no need to carry it 23miles or so.”. Doing as she requested, and left the bag in her competent charge, all ready to go. Austin told me I had to travel in the back of the wagon, as Penny was accompanying him to a farm away from the hotel. I did not mind, it was a lift but! it was cold and draughty sat in the back of a wagon for 20miles or so. I arranged some hessian bags around me to give some warmth, and comfort. It helped somewhat. All the way up the coast road, large waves thundered on the rugged shoreline, big white sea crests breaking as they neared the cliffs. Snow drifts alongside “B” road. Hotel at John O’ Groats in view. What a building, with its castle like features, and snowcemed walls. “OK Son we are going along the top coast, Cheerio Good Luck”. Now I was at the start of my journey. Already at 4pm many people milled around in little groups. I wandered around the back of the Hotel to view the magnificent cliffs and Pentland Firth, with Stroma Island distant in the wild sea. Having time to kill before 5pm, I ventured further along the coast. Returning to the Hotel I enquired could I go in to have a look around. No was the answer. Too many dignitaries were inside, enjoying, no doubt, luxuries we could not afford. 4:30pm came, fireworks, and Scottish Pipe Bands and Drums belted out stirring marches. Rockets, Roman Candles lit up the winter sky. Helicopter flew above. I sat down behind the large mass of people, ready to go. Taking it all in, an Irishman sat down beside me, “you will never see this here again” he commented. I nodded. Watching the competitors line up on the icy narrow North of Scotland “B” road, complete opposites of clothing and footwear were on view, from incredibly T shirts and shorts with Nike trainers, the temperature was freezing, to full packs and duffle coats, with heavy duty trousers and boots. An Everest expedition came to mind. Also, southwesters, with waterproofs, and wellington boots. Someone had seen the long-range forecast perhaps, Ladies with sandals on feet, 100% blisters and sore ankles. Quite a varied mixture of gear, whether it was serviceable or comfortable, did not matter anymore. They and I were moments away from a 1,000mile journey, taking place in mid-winter, what the end outcome for over 1,000 starters would be unfolded in the coming days and weeks. Gus Britton, famous Channel swimmer, had the loud megaphone, belting messages out to the young / old / male / female, then a low flying helicopter, with Sir Billy Butlin on board waved a large flag, Gus Britton duly sounded a large blast on an effective air horn and away the large horde of competitors rushed away at spot on 5pm. Around a minute or two I got up, did a bit of usual exercises, just to put some warmth into my cold bones, and set off behind the outstretched column of people on the road. The Irishman stayed with me, confusion was etched on his bony features, he must have thought I was a local watching the proceedings. 17miles to Wick, 17 cold, windy, miles but mixing with other distance participants made it feel somewhat less. The lights of Wick gave relief to the constant blackness we just encountered. I was not aware at the time a large ceilidh, was going on at “The Sov”, many persons from the walk gave into temptation and stayed. Leaving Wick, darkness enveloped us again, although a desperately cold night, my body, breathing and eyesight rapidly became accustomed to the strange, to me, circumstances. After 23miles Penny and Austin greeted me at the garage, complete with rucksack as requested. Penny said not many had gone through, around 30, she informed me, I was thrilled at the news and thanked the ceilidh in Wick under my breath. Austin shook my hand saying he had prepared a hot flask of tea, with some hard stuff in, just for medical reasons. “fine Austin can I drink it now among good friends together. “Yes”, Austin and Penny agreed that would be nice. I gave the passing Irishman first go, then I used the beverage along with Austin and Penny. Refreshed continued along the long narrow road. The early Saturday morning hours passed slowly only to be interrupted by “Paddy Irishman”, groaning about being cold. A little later with a mannerly tone asked me if I had a drink in my bag. “yes, get it out yourself I am not stopping”. Paddy found the bottle, a quarter bottle of Hennessy cognac brandy I had been given before leaving home. Personally, I hated the stuff, so “Paddy you are welcome to it, no problem!”. He did not reply! just motioned and shivered, not looking to good at all. Ahh well, get over it I thought. Gradually I noticed I was on my own, the Bible came to mind, St Paul on the road to Damascus “and some fell by the wayside”. Persevering on my lonesome, the cruel East wind was chaffing my face, and tops of my legs. I had Vaseline in my bag, but I would have had to stop, and open bag then apply it. Face was not a problem, but legs no chance! Covering around 35miles since leaving John O’ Groats, most in pitch darkness, with very cold windy conditions, something came to mind, I had never done before in my life. Knock on a strangers’ door and ask for shelter. The crofters house set by the icy roadside was my aim. Low lights dimmed the small house. Gingerly I raised courage to knock, an elderly Lady answered my knock, “come in Son”. Gladly I went in. The advantage of being free of the constant cold wind was beautiful, however, I was not on my own. The entire living room was full of bodies. The glow of an inviting peat fire scarcely visible, steam from damp clothes, filmed the tiny windows. “sorry Son, you will have to stay by the front door, just inside”. I thanked her, making myself as comfortable on the coconut mat. After an hour, the draught under the door was proving to much of a hazard for my body to stand. I was envious of men by the fireside, so standing up I signalled to the lady, I was away. No one joined me, out on the lonely road. I began to shuffle a little, I had to get warmer, so a forced run/jog helped me feel better. Slowly daylight started to appear, my first night completed, it felt good, but I was hungry, but not in bad shape. I scrutinised every tiny building for provisions, eventually coming across a small breakfast hotel, hallelujah! Entering quietly closing the door behind me, I enquired if breakfasts were to be served, “yes, Son”, sit you down, so early in the morning, be patient we will get to you “. I then realised I had upset their early schedule, but I was hungry, and the warmth of the tiny quaint room aided my recovery from the overnight winter cold. A mug of tea, and a bowl of porridge, followed by sausage and eggs re-invigorated me. Moving across the room, I asked the Lady how much, “OK Son, you are the first we have had in, we have not seen many on the road”. I set off for Berriedale next big place, in good heart. My schedule of running, jogging, walking was becoming a pattern, no question of hitching a lift like I was used to. I was totally in charge aided by a lovely breakfast. On and on Saturday, became Sunday, the holy Sabbath, not used in a lot of places. In North of Scotland it was revered. During Sunday morning around 12:30, I came cross a small grocers shop, it was open, again entering slowly and closing the door, two elderly Ladies were having a chat to the middle-aged Lady grocer, on and on they chatted. I felt uncomfortable, the heat of the shop making beads of sweat appear on my forehead, I felt unsteady. They were oblivious to my distress, I reached out to what I thought was a shop shelf, no, it was a stack of Kellogg’s Cornflakes, down they went tumbling over the shop floor. Conversation between them ceased abruptly, all three enquiring on my health, the shock upset me. I mentioned I would replace the stack, “oh no laddie, not at all, what do you require”. In a confused state I mumbled two bars of Cadbury’s Chocolate please. “that’s all laddie” she said. “yes please” offering to pay for them, “away you go, and take care of yourself”. All through Sunday I managed with my chocolate, but coming out of Berriedale I was confronted with the largest hill I had encountered. Ord of Caithness earlier was a trial with ice on the road making conditions underfoot dodgy. Berriedale hill was a monster, daylight was falling, so darkness disguised the final push. Sunday gone. Monday was getting me into a routine. My body was reacting well to abnormal functions, but hunger and sleep had to be addressed. Onto Helmsdale, weather was still hampering, wind, ice, in plentiful gusts and icy roads. I addressed my sleep problem, with a solid 4 hours early Monday morning in a wooden bus shelter. Using my re-arranged rucksack as a pillow, and zipping my battered track suit to the neck. I awoke freezing and exercised vigourably to get the blood flowing around. After being alone for 2 days I met company from Southern Counties, “doing well Son”, a platoon of Essex participants informed me “we are well up the field “.Whilst it was good to have company I remained dubious on their fitness ability, at least two of them must be in the 16stone region. A terrific strain on their feet, Ahh ! well each to their own. Banter was exchanged, hunger was my priority, not to theirs. They had eaten well at posh hotel further back along the way. I was understandably jealous of their obvious finance. Along we went until a greasy spoon, for long distance lorry drivers, appeared on roadside. I was quickly inside, young lady took my order, with a generous smile. Bearded lorry drivers eyed me up and down. Mug of tea, meal, and sandwiches put in front of me. Excellent service, not looking up, I devoured every scrap. Returning my mug and plates to the counter, “thank you, what is the charge please”. The young lady said “no charge number 7, did you enjoy it “. I sure did. She looked across at the burley bearded drivers, they saluted me “good show sonny, how far today”, “sorry” I said, “I don’t know the mileage, but it feels like 40miles”. Again, young lady confirmed not many had come through, and I looked the youngest she said with that generous smile. I waved to the lorry drivers, and in a spontaneous gesture blew the young lady a kiss. On the road again Tuesday, Helmsdale behind I refrained from searching the map, I put a good stint in and was curious that Essex men had had not shown. My answer was given at the first random checkpoint marshalled by Gus Britton.In a remote lay-by, my diary and passport were stamped, and Gus informed me 25th position, over 350 had retired, and over 75 disqualified for accepting lifts in vehicles. Casually I asked about the Essex men. Oh! been monitoring them since Berriedale, they have been eliminated for lifting. Placing my diary/passport safely away in my bag, I waved to Guy, he acknowledged me. A few more decent hours on the road, then sleep. Day 4, towards Lothbeg, company emerged, middle aged men and ladies, pushing on quite hard, around 6 of them. Not much conversation, but quite intent to do well in the event. No complaining, no laughter, just concentration. I was not loitering, with my pattern of mobility, a good 5miles per hour constant. Their pace was above mine, but I really wanted to maintain contact with them. I ran more than jogged/walked. Gradually being able to cope, I settled down just a little behind them. On and on through beautiful Brora, with its wonderful sandy beach, past Dunrobin Castle, with its history. On to Golspie, still maintaining a good pace. Hunger and sleep never far away from my feelings. Company kept me alert, and focused through lovely Spinningdale, on Bonar Bridge, with Ardgay and Evanton coming up. A scenic part of Scotland. Eventually before Alness conversation broke out among the speedy company. Foul language aplenty was spoken loudly, my thoughts were confused “why”. Turned out they were not able to find their mobile transit van. So, turmoil in the ranks. Taking advantage of unrest, I moved on to Dingwall, heading for Beauly. My day might have been hard, but covering good distance made me feel pleased, and I was grateful to the company for tugging me alongover the miles. Sleep was needed, hunger could wait, keeping my mind busy looking for anywhere I could use for a few hours nap. Nothing for mile after mile, no knocking on doors this time. I was just tired, not cold, nor freezing and chaffing with the East Atlantic wind before in North Caithness. OK, I was down to walking and my pace dropped, but I searched keenly for a farm, lean-to bus shelter, to get my head down for a few hours. The sleep situation, I had not paid enough detailed attention towards, but now 4 days and nights into the proceedings, all of which had not been comfortable, and been in, catch as can, sheltered places. My thoughts as I looked for my makeshift next sleep were focused on the subject. In Northern Scotland, the random bus shelters, wooden timber sheds, provided adequate cover away from the elements. They would serve me well early night-time/morning hours, not ideal, but hotels and such places were a financial restraint on my meagre budget of just over £20, which I dearly wanted to manage to control for most of the event. Clocking a reasonable good 4 hours of mixed, run, jog, walk, I retired in a remote shelter, using my formula of zipping up tight and a pillow of my rucksack comfortably re-arranged, peace and quiet in an isolated area, perfect for a nod. Maybe 2 hours into my rest, loud voices awoke me. Four participants gabbling on about their recent exploits, well! I thought company would be a change, so my nod was disturbed, and away I went to join up with the foursome. A good pace they set. Chatting as going along the quiet road. I listened to their conversation which was definitely a South West of England accent. I enquired about their day to day arrangements. The tallest and loudest said in his West Country twang, “got a car and caravan back up, regular sleep, and meals, at organised meetings along the route”. “excellent” I replied full of jealousy and envy. “yourself, how are you making out”, “oh”, I replied, “I make do and mend”, “must be difficult”, the tall man said, “it has its moments, I am still trying to get a formula, and routine together, but I get by “. Soon I realised their constant pace was hurting me, having had not much rest in a long period. Reluctantly, I allowed them to continue, my pace was adequate for me, so I made my way in solitude with caravans on my mind. A farmer’s buildings appeared on the roadside, all in pitch black darkness, my mind although immersed in luxuries of caravans, was alert enough to see the possibilities of a few hours sleep in a barn keeping very quiet in case of farmyard dogs. I searched a while to find a barn, complete with hay bales, soon I crashed out, to be awakened by daylight, gosh!I had a good 6 hours, quietly I left. Stiffness in my body took time to move. I must look a sorry sight. Shuffling along I thought again solitude, to see my predicament. A Post Office at Beauly, with a tea shop attached, served me mug of tea, soup, and sandwiches, splendid. It was nearly closing for them, so I remined myself about post cards to go home. Maggie Sinclair got me a North Caithness, I purchased a South Caithness, Ross & Cromarty, and paid for the meal. Could I write home and post them, I had time, “yes”. The lady put the closed sign on the window and allowed me to correspond home, “let me know when you are finished”. Duly I completed and informed her I was away, opening the door she placed a bag of caramel toffees into my hand for on the road, she smiled, “good luck Son”. Wednesday was a day and night full incident. A man in Beauly on the outskirts of town, came up to me, “hello Son, going far today”, “hopefully” I replied, “it’s a hard road in front of you, the Struy is a tough mountain road with little shelter in good weather”. My map, my map I had not referred to it for a long time, “thank you Sir I will be aware”, daylight was fading. Cracking on, he was perfectly correct, the Struy was formidable, especially in darkness. The quietness was total, all alone I had a good night’s work. On summit of Struy lights of Beauly behind. Drumnadrochit in front, on the North end of Loch Ness, were vivid in cold frosty night air. Still in good shape I headed towards Loch Ness, again in solitude. I wondered why so few participants were encountered on the route down the North shore of Loch Ness. The West side of “B” road skirted the Loch all the way to Fort Augustus. Still happy and moving along but getting tired after a good, but long day and night. Milton village had a timber bus shelter, my next rest. Inside I quickly nodded off to sleep. 6 hours later back on the Lochside road. The early morning was bitter cold, frosty and ice on the road, making for treacherous travelling conditions. Before I had shaken stiffness off and struggling a bit, a tall figure came beside me, “OK number7” spoken in an authoritive manner. “good morning to you”, I replied. He conversed with me in his haughty accent. I was at unease in his superior manner, keeping it together with him was proving difficult. He provided me with his credentials. He was a Lords son, and regular updates on his progress relayed daily in Local / National newspapers. He enquired about my standing in life, telling him I was a miner in Northern coalfields. After a brief pause, he hit me with a rather rude challenge. Invermoriston Castle on the way to Fort Augustus, was a breakfast and rest stop, a full 12miles away. “OK earthworm I will have you a wager, the last one to Invermoriston buys breakfast”. Hurt by his reference to miners I foolishly accepted his bet. Still a little stiff from my extended sleep, I soon lagged behind his long ramrod stride. On and on further and further he got away. I was in trouble, I could hardly run icy roads preventing me. I said to myself “that’sit you have blown a hole in your budget”. Whatever was I thinking of, taking him on. I continued to push on with no sign. A thaw allowed me to run. Coming to the first sign of the Castle. Appearing on the side of road was the Lords son down on the frosty grass verge. “My word”, I did not say, or enquire about anything, just took heart and ran on. The Invermoriston white signpost was reached. I waited patiently for his Lordship, no show. So, I carried on, and to my surprise I was in big trouble. Aching and cold, then sweating, caused discomfort big style. First hotel was the Inchnadarroch before Fort Augustus. A grand hotel, normally I would have gone by and dismissed, its facilities being too expensive. Circumstances were dire, I was in need of shelter and rapid. Entering the hotel breakfast was in full swing. Stares aplenty by guests and staff. A table was offered to me by waitress staff. I sat down at the table with starched white linen tablecloth and full silver service, with top class china. “Breakfast Sir”, “yes please”. The room was beautiful, but I needed rest as well as food. Putting my hands on the table, I put my head down on my hands and crashed out. 12 hours later I woke up in a bedroom of the hotel. First reaction, I was soaked wet through. The covers, sheets were wet through, had I weed the in the bed, no! it was something more serious. A man and a lady came into my room. I was most apologetic, “how do you feel Son”. I got out of bed slowly. My legs were weak. “sore” I replied. I informed them of my five-day history. The man told me it was mild hypothermia. Extremely bad considering the temperatures I had endured without any warm lengthy sleep. A maid came,cleaned the bed, putting fresh linen on, “now go back to sleep for a little while and let us know when you are ready”. The maid made me a hot toddy, with plenty of sugar in. I drank it and slept. After 2 hours, I wandered downstairs, in a peculiar state of mind. “sit down”, a maid said, “would you like some hot tea”, “yes please”, “and food”, she said, “OK thanks, yes I would, I would like very much”. I cleared my meal and drank my tea, now came the crunch. I had stayed around 16 hours, in a high-class hotel, although it was very necessary. Going to reception my throat was dry. Asking for a drink of water, the man who saw me in the bedroom, looked me over, sure you are up to leaving. “yes Sir”. At the desk I requested to pay the bill. Imagining an event shattering moment, receptionist said “would eight shillings be OK for you Sir”. “Indeed, it would”, I replied, thanking all staff for their kindness. Resuming the walk was strange. My body was sore, my legs were weak. Five days efforts saw me in top 20, but wide open to the worst elements Northern Scotland had endured. Encountering 2nd Checkpoint at Laggan, another random post set up, my documents were scrutinised. Over 400 retired, 100 disqualified, I was down in the 60’s after my enforced rest. Struggling on, another 17 miles covered, hungry, very tired and concerned. 6th day was my worst by far, but grateful, I was still, continuing.Through Fort William, with Ben Nevis obscured with winter cloud, I enjoyed some good company on the road. It seemed lower down the field people were more relaxed, although many had back-up. On the topic of back-up, no aid stations had I seen at all, as promised. The scenery was brilliant, seals in Loch Leven, buzzards on the overhead telephone lines, deer in the forests. Passing the Corran Ferry, I was feeling better, pressing on towards Onich, and finally Kinlochleven village. Whilst resting on the road bridge, a lady asked me if I was staying anywhere that night, “no”, I replied, “no arrangements, come along”. I followed her to what seemed to be Council houses on a small style. Turned out they were houses to rent for the aluminium workers at the nearby plant. A large black bungalow range fire was most welcome, sitting beside it on a small wooden chair, I soon dozed off for around 4 hours. Awakened by happy voices of young ladies preparing for the monthly dance in the village. “want to come Laddie”, they invited me. I was tempted, reminding of days with friends at home at local dance halls. “thank you very much for your invitation, I must carry on “. “OK”, they all said, “we will walk away with you, the dance is on the roadside”. Surrounded by young ladies, we chatter along the road. Noticing most of them wore scarves, and gloves to their elbows, I enquired about the fashion. At the factory most employees suffer from boils. Scarfs and gloves hide them from view, “it is something we have to suffer to get a regular pay day.”, With that, with music blazing out they said goodbye and went to the dance. Lonely on the road to Glen Coe, my mind thought about boils on the attractive young girls, what a shame, but miners risked hazards just as well. I felt close to the workforce of Kinlochleven. Coming into Glen Coe alone in the darkness was scary, after stories circulated about the place. We had now completed our first major detour. From Inverness-shire to Argyll and Bute, from East to West. Mist came, followed by first heavy rainfall. Rannoch Moor in front of me, a desolate, isolated place stretching out to Bridge of Orchy. Only broken by Kingshouse Hotel, an ancient hostelry on the side of Rannoch Moor, frequented by tourists. Again, I experienced total solitude, vehicles on road nearly non-existent. I was moving better, and pushed on. Suddenly music was heard on the moor, coming from in front of me. I hurried towards it. Five Scottish men were belting out marching tunes of quality. “Good evening to you, I appreciated your singing back there”, “OK Laddie, on the 1000miles are you, “yes I am”, “well we are going to Kingshouse for a doo, walk with us till we get there”. Inspiring to hear music on the wild Rannoch Moor. A rather pleasant few hours covered. “goodbye Laddie”, and they belted out “keep right on till the end of the road”, as they walked down to the castle type hotel. Once again alone, I pushed on, until a middle-aged lady appeared in front of me. “Hello”, I greeted her, “soon be daylight”. No answer. Together we matched each other stride for stride. No conversation until rain became heavy again. A load of bad language was spoken by her. Then nothing, total silence. Bridge of Orchy reached, she disappeared, completely into a small croft. All types, all sorts, on this venture. Outside Orchy a group of people milled around. Gus held a random checkpoint. Documents checked, and information passed on. Around 450 leftin the race out of 1,300 starters. I was in 42nd position, with a big group just in front of me, from the Midlands / Birmingham area. A Post Box nearby, so I posted cards for home. A man asked me of my correspondence. Told him of my purpose. “very nice, very nice”, he repeated. Much more company now on the road to Tyndrum. A railway station splits towards Oban, on the High platform, on Lower platform to Fort William. Arriving at Tyndrum, food and drink, and rest in local tea rooms, very welcome. The long slog over Rannoch Moor, well over a week had gone by, apart from my bad spell at Fort Augustus, I remained in good shape. Sleep and hunger always taking priority. I had learned to get by 4 to 6 hours sleep, when the opportunity arose to get it. One meal a day was sufficient, usually early morning, or late evening, when available. Now arriving in the Central Highlands, more choice available to participants on the road. Downside was more traffic encountered. In March 1960 cars were plentiful especially day trippers at weekend. Crainlarich, Strathyre, Callander, all pretty villages, with rivers, lochs, forests, mountains, and the whisky distilleries, a mecca for Glasgow / Edinburgh tourists. Just before Strathyre on the roadside, beside the loch, a family on a picnic. Their transport a wonderful Rolls Royce, with mahogany interior and plush white seating, complete with beautiful tent and awning, invited me to share their drink and food. Children, all girls, required my autograph, which I duly signed. The man and lady of course questioned me on my journey. He was a doctor, she was a nurse. When I mentioned the bad incident, I had endured early on, after 5 days, both conversed together for a while, then the doctor said,“yes Son, hypothermia, you were lucky indeed to recover so quickly, I am amazed you covered 17 miles the day after”, the lady then said,“indeed Son you must not let that happen again, absolutely not”. Children were convinced I was the youngest on the road and photographs taken, I could not disappoint them. Not knowing at all an RAF cadet was strictly younger well behind me. Reaching Callander I met up with a Geordie from Ashington, Northumberland. A fine young man in his late 20’s, he too was well up until blisters and ankle problems, hampered his progress. Heavy built around 13 stone, with a jovial attitude to everything no matter what. He was great company, also his manners, were top notch, as we travelled together. We travelled together for 3 days or so, down into the industrial towns of Airdrie and on to Lanark, easy to sleep places and plenty choice to eat. All free mostly courtesy of bus shelters, farms, and interested people paying our bills. Geordie would display enormous charm, when discovering his bill had been paid. A mannerism of great technique, but totally off the cuff, not planned nor arranged. I enquired what his employment was. He was a riveter in shipbuilding, quite a surprise with manners and popularity he controlled in abundance. He confined in me, strict Methodist parents gave him values as a child, although he rebelled against them, he never forgot their honesty and well being to all matters. Down into the Northern towns of Southern Scotland, Biggar, Kelso, Peebles. Geordie’s problems returned with a vengeance. Swollen ankles, and large blisters forced him to retire. I was so sad to lose such a good companion. I wished him well and carried on. Again, solitude, but in a very different environment. Villages were more readily convienient, although areas spoiled by increased traffic. Onwards I pressed on. A vehicle drew up beside me. Gus Briton, asked to see my documents. What a surprise. After stamping, he warned me of Beattock ahead. “Tough hill, heavy traffic, many lorries, keep tograss footpath if possible, you are now 37th place with 400 left on the road. we are still eliminating people for lifting, our monitoring skills have improved immensely since the start, see you later, bye”. Gratified by the knowledge of what lay ahead, I ran, jogged, most of the way to make up time I would lose over Beattock. But surely traffic built up, lorries sounded their horns, cars pomped. I remained on the grass verge, carefully treading warily. Progress was slow, and tedious, but I had to be patient and tolerate the circumstances. For ages it went on, I did not want to be in dark, which was not far off. I tried desperately to quicken my efforts. My legs and feet upset by walking on the unfamiliar terrain. A wider traffic footpath gave a chance to jog a little alongside the traffic. Soon thankfully it was over, and I could relax from the uncomfortable hill and grass verge. Lockerbie, Abington, Crawfordbooth, Ecclefechan, Kirkpatrick Fleming, before motorways, the “A” road supplied a through route. Easy to navigate, back to a rhythm, of run, jog, walk, eat, drink, sleep. I arrived at a Little Chef in Kirkpatrick Fleming. Around 10 End to Enders were sat down in the café, debating loudly about the distinct lack of aid stations available to them. The meeting became rather heated, and the staff were concerned for other patrons. Going to the counter to order a light meal and tea, lady spotted my number 7. “You are not with them I hope” she enquired, “certainly not”, I said. But I could not be dragged into the debate. I sat down with my meal listening to the complaints of them. Other people, tourists, lorry drivers, were taking notice of them. Staff were visibly uncomfortable. I maintained composure until the mention of aid stations, frequented by most of them, were not adequate. I stood up pronouncing my number 7. “Nearly, 500miles covered and not one aid station have I visited. You seem to be more in touch with the rules than me, but please make your voices heard somewhere else, not in a public place for everyone to hear your valid, or invalid complaints”. Just as I finished the made-up speech, Gus Britton and his companion walked in right on cue. I said goodbye to them on my way out. The room was silent. Out on the road heading for the border with England, through Gretna Green, mecca for elopers for weddings, I realised I had covered Scotland, almost, and reminisced my time, travelling to, and down, it gave me great experiences, good and bad. But all worthwhile. On I went “Haste Ye Back”, the large sign and further on “Welcome to England”. Longtown first, and the Metal Bridge Inn close to the river, passing by. I continued to Carlisle city, with its Castle and Cathedral. Many hotels all in a small area, tempted me to stay, as a bonus for covering Scotland, my finance could stand it, I had been shrewd. However, I declined. Instead I charged on through Northern Cumberland, not Cumbria, level route overnight to Penrith. Morning was wet with grey skies and poor visibility. I scoured the road for a shelter. A greasy spoon was ideal, packed with lorry drivers on the Scotland/England trunk runs. Requesting a fry-up and large tea I sat down near a warm Calor gas fire, situated near the outside door. Questions soon came thick and fast, “half-way Son, will you make it”, or “how far today”, or “where have you come from”. Doing my best to answer them, my tea and meal rescued me. Again, in no time my meal had gone washed down with a good brew. My appetite was “tip top”, no waste, or picking. I stayed for a while, rain was pelting down outside. A driver requested a seat at my table “certainly Sir”, go ahead”, He stuffed his large portly frame into the seat, “bad weather Son, bad forecast for week “. Very comforting I thought, but he was only stating the obvious. I started to write postcards home from South of Scotland Counties and Cumbria. How many I did not count, but quite a few. “keeping you busy, writing”, the driver said. “a little time to catch up, being the rain is quite heavy”. I glance round the room, drivers were stood up queueing waiting for a table. I got up and motioned to one. He came over, said “thanks and good luck”. Outside I buttoned up, securely fastened my laces and returned to the daily grind. Pushing on, the rain swept roads covered me in road spray. Soon I was soaked. Horns hooted, cars pomped, I was alone again in harsh conditions. The Shap, Kendal and Lancaster, I memorised from the map. A fairly tidy climb over Shap, followed by downhill to the market town of Kendal, on through Beeston and deer in the pasture fields, to the City of Lancaster and the magnicifant Skerton Bridge crossing the River Lune. Busy, busy, was the city. I ploughed on through, to a village outside Scorton, to find a place to eat/drink and possibly dry my wet clothes. The small café was next door to launderette. Elderly lady welcomed me in “look at the state of you, Oh! God, you are soaked to the skin”. She let me borrow a large overcoat, which swamped me, “go in the spare room, lock the door, and give me your wet clothes”. I returned dressed in overcoat with a carrier bag of sodden clothing, “Jean will take them next door and dry them properly. I will fix you a meal and a warm drink.” “I am very glad I called in here Madam”. Joan said, “we will fix you ready to go, hope the weather gets better, awful lot of rain we have had”. My meal and drink again quickly devoured, was followed by custard and apple pie. “excellent Joan”, I said. “glad you enjoyed it Son”. Jean duly returned my dry warm clothes. Again, I used the spare room to change. They felt so warm and comfortable, my newly dried clothes. Ah! but can’t dwell, “how much” I asked,” 2 shillings for the dryer” Joan said. “Many many thanks Joan and Jean”. I was away, still damp, but nothing like it was. Garstang, Fulwood, Preston, Wigan on the horizon. Built up industrial areas, with loads of history. Rain kept off and I was alone again, until a Cockney Londoner I caught up with. “good day, better weather”. He just grunted “if you say so”. He was a participant with a high number on his coat, which was wet through, along with all his clothing. He looked at least 50 years old, but an old 50 years old. His pace was laboured, his whole being did not look too good. Ah! well not my fault I carried on my way, left him labouring along, for how long, I did not give much hope for. Preston city was choked with traffic, and pretty hard to negotiate, for a footsore pedestrian. Again, hoots and horns from motorists. I waved back occasionally to accept their noises. On and on industry and industry. Towards Wigan, bus, car, lorries clogged up the main street, then main Railway Station, and to the outskirts, rows and rows of Victorian terraces. I sat down on a wayside seat to release one of my trainers, feet were sore and swollen. My bag had a remedy inside, before I could apply ointment, rain came down in a torrent. Quickly rubbing it in my foot, replaced the remedy in bag, replaced my trainer, and was off again looking for shelter. A motorist came up, “get in Son, out of the rain”. I agreed, foot was very tender, and rain was quite heavy. “where are you heading “, he asked. “Warrington direction” I remarked. “Soon have you there”he remarked. “Oh! No”, said I, “Oh no let me out now, oh! no!, I cannot accept a lift at all “. The driver was taken aback, but said, “it’s raining, and you are having foot trouble”. “Of no concern to you, open this door and I will be gone”. Duly he let me out. I was more concerned if anyone saw me with my number 7 clearly on view. Getting out of the vehicle, thinking on my feet I wrote his car make and registrationdown, just in case anything was reported. Rain had stopped, but I elected to carry on with a sore foot, intending to find the correct place to administer repairs to both feet at my leisure. Short of Warrington, quite a longer distance than I planned, a Veterinary Surgery appeared. I enquired at the door “could I come in and tend to my feet please”, “of course my man”, a large red-faced man said, “come in”. Leading me to a room covered with photographs of animals. I sat in a large comfy chair, opening my bag, “no need Son, Lucy the nurse will sort you out, just relax”. In her blue overall, Lucy, asked me what was troubling me. “Both feet nurse, giving me pain”, “OK, let’s have these trainers and socks off”. Feet were indeed swollen, she massaged my lower ankles, then feet, then applied warm water compress, slowly rubbing ointment to my soles. The effect was soothing. Replacing the compress with hot ones felt good. Then applying ointment to toes and upper feet, finally removing compress and massaging both feet. She replaced socks and trainers, fastening laces securely, but not too tight, “stand up “, she said, “walk around the room, how do they feel”, “much better Lucy, thank you. “.” You are welcome number 7, excuse me, I have patients with four feet”. I laughed, and waited for the large man to appear. Eventually he came “still here Son, everything OK”, “Yes Sir, how much do I owe you”, he laughed, “Did Lucy ask you for payment”, “no Sir”, “well neither do I.”. I skipped out of the surgery, waved to them, and away on the road to South. Cheshire County was level, with trees, forests, and lush pasture land. Northwich, Tarporley, Whitchurch next destinations. A soldier from Saltash Cornwall, joined forces with me. “Just had my cards checked” said Ernest. I panic, never saw the post at all, “don’t worry, probably get you further down the road there is a purge on “lifters” at the moment, they think they are safe, but Gus is a wise bird and soon will have them”, Ernest replayed that less than 300 were left on road, somewere on their uppers, and do not expect more than 200 to finish. We were around the 70 placing. I lost heart a little, I was going down the order, but rain and foot attention, and over staying my stays, all added to loss of time. Ernest was easy to walk beside, and general good company, however he liked a drink or two at night. I soon found out. First night together, 2 pints of bitter he ordered in the first pub we came across, Landlord said “on the house”. I told the amiable Landlord could I have a warm orange juice instead. Ernest looked at me “my word Son, looks like we have some learning to do”, Landlord winked at me and we sat down in a warm snug. Not long he ordered again, “one pint of your good ale”, “not for me”, I blurted out, “I am off now, good bye”.Through Tarporley, onto Whitchurch, having minor foot problems once more, lower legs feeling heavy, swollen, I knew to neglect sign would be worse in days to come, but I was keen to keep going. A cottage Hospital in centre of Whitchurch seemed ideal to check my problem out. Admitting myself it was only a minor stop, but it was second time inside a week it had bothered me. An examination of both feet and lower legs was done. Doctor sat down with me “well ! !, only a good rest will repair damage”, realising I would want to carry on, naturally, he prescribed anti-inflammatory tablets, and strapping around lower ankles. I agreed, but did not take the tablets. Strapping was applied, and it felt more, as if the swelling had receded. “Take care Son”, said the Doctor, and I was away, heading for Shropshire County. Hodnet, Wem, Wellington, tired, sore, hungry, my mental state was not good. Also, I was lower down than I had ever been, something had to be done to raise my spirits. I searched for a café. Having found a lovely small café, I went in and ordered the most I had eaten since leaving home. It felt good, I was warm, no hunger, no pain. What I needed now was rest. Moving on to Hodnet, a B&B advertised rooms. I went in took one look and retired to bed. It was excellent. 8 hours good sleep. My mind was clear, although my budget had taken a battering. Legs felt stronger, so away on the road, only to be able to walk and a little jog now and again, but I was mobile. Through Wem, dark now, towards Wellington. I was stopped at a random check point by Gus Britton’s second in command. Showing my documents, I learned less than 200 were still mobile, mostly down to retirees. My position had dropped to 95, again my lowest placing since the start. Ah! Well I was still going, and able to continue. Gus Britton’s friend looked at the listings “quite a few ahead around 30 minutes “, he informed me. Encouraged by this I attempted to jog/walk along to my next destination, Kidderminster, a large carpet manufacturing town. In the night miles went by, but no End to Enders did I see. Through Kidderminster, going into Worcester, nothing but solitude, not a soul. Mostly walking with occasional jog, but still unable to break into a run. The lower legs would not allow flexibility. Outside Worcester, food, drink, and rest stop. Most gratefully provided by two smart suited business men on their travel duties. Requesting information on the 1000miles walk. I obliged by giving a brief description of what I had experienced. “long way Son, but you are heading in the right direction, weather should be better, hopefully”. Thanking them I resumed my journey, nourished and rested. Leaving Worcester behind, the long trek to Cheltenham in front of me, the day was fine. People waved, I grew stronger, and began to run a mile or two, then walk and jog. Until a pattern to which I used well early days came flooding back. Feeling good reaching Cheltenham, time for a quick brew and snack, and onto Tewksbury via a lengthy de-tour. It was destroying, traffic, footpaths, were quite bad, roadworks, roadmen, machines, uneven roads of considerable distance. My whole body and mind ached from concentration on safety. Traffic was terrible, coming close up to me on disjoined made-up footpaths. What on earth had they arranged this horrible section of route for. It was a trial we did not need. Entering Tewksbury, a big surprise, I actually found my first and only aid station on the whole walk. Making the most of my luck, I requested what was on offer, a three-course meal, soup, pizza, and ice cream, with a coffee, luxury indeed. Two volunteer ladies served me well “not seen you before number 7”, one of them said. “No Mam and I have not seen any of your aid stations all the way down”, I replied. She did not seem impressed by my reply, turning to her colleague to repeat what I just told her. “sorry if it offends you, but it is perfectly true”. The de-tour had upset my rhythm, my pattern of run/walk/jog had gone, walk was only just possible. Struggling on, I thought about counties I had covered, and how many there would be in front of me. Bristol seemed far, far away. But in small stages I persevered, passing Filton Airport, and Bedminster Zoo. Trudging along the busy city streets, alongside the docks, under the Avon bridge, until the signs of Bridgewater appeared. Now in the West Country, only Somerset, Devon and Cornwall stood in my way for completion. Outside Bridgewater I spotted a swimming baths. I enquired about an individual bath. “OK Son, we can do that”, I sat down inside awaiting instruction “OK Son,this is your cubicle and your bath is next door and ready”. Quickly I un-dressed and I jumped into the bath. Hot! is was Hot, but so invigorating, I just lay there soaking, warm. Rubbing myself dry, dressing I felt good. On my way out “feel better Son”, “much”, I replied. First wash in two weeks. Stepping outside I felt alert and ready. I tried a slow run,OK, a jog OK, another run fine, I was back on schedule. Happy I made my way towards the far-off Taunton. But the heavens opened mid-afternoon, rain, thunder, lightning, road awash. Soon I was drenched. Cars pulled up, “get in Son out of the rain”, meaning well no doubt, but I refused had carrying on, although tempted indeed. After a mile or so, my prayers were answered. An American style Motel, had vacancies, inside I went. A young pleasant girl informed me of the cost of staying, adding she could not reduce the fee, although she herself would like to. It was expensive, very expensive. The rain battered down outside, and I was wet very very very wet. “OK, Miss I will take a room”. I was met by heat from switched on radiators. “thank you I will be fine now, give me 4 hours and I will be away”. Clothes on the radiators all over the room to dry whilst resting in bed. I remember windows steaming up quickly from moisture drying wet clothes. Soon the 4 hours went by, a knock at the door, “OK, if I come in”, a girl’s voice said, “yes, I am decent”, She brought in a tray with tea, sandwiches, biscuits. “smashing thank you “. I said, “is it still raining”, I enquired, “pouring it down”, she said. Taking my time with my gorgeous meal, I felt my clothes, they were all dry. Ready for the off, awaiting rain to stop, I went to reception to cover the cost of bill. Her face was apologetic, “so much Sir”, I felt a little distressed, I was now under £10 and had to get the train home, when finished. Outside the day had improved. On my way again. I began to see if my rhythm was intact, run/jog/walk, not too bad at all, so onto and through Taunton. Now I was feeling better, the West Country lanes were covered with yellow flowers, very colourful in the March sunshine. “Hello”, a voice hailed out, Ernest the soldier from way back on the walk. I returned his greeting and together we chatted going along country lanes at a good walk. Company and feeling well, altogether things were much easier. Leaving Taunton behind, Tiverton was next stop. Ernest still liked his beer at night, and I would carry on through. Rest up in a barn, or bus shelter, or factory foyer. Many many times I had used this method, chiefly it was available, second my money situation was low to say the least, not able to afford the luxury of a B&B, nor a hotel or such. Early morning Ernest would appear from nowhere, with a cheery greeting. How he rested I do not know, I never asked. On through Tiverton, onto Crediton. Same daytime walking, with his normal stop for a pint or two at night. At Crediton the weather turned cold and wet, so I joined Ernest in the public hotel The Barley Sheaf. Soon he was the life and soul of the pub. I sat down on my own listening to his tales he was banging out, with a glass of warm orange. At the bar stood a frail looking man with a long grey gaberdine, and a trilby on his head. After a while I said goodnight. Going on my way the man at the bar also followed me outside, “which way you going Son”, “South”, I said, “towards Lifton”.“Mind if I join you”, he said “no not at all”. Darkness and quietness, with cats-eyes in the road sparkling, mile after mile, not a word was said. Until coming to a small junction in the road he asked, “are you religious Son”, “I have faith”, I replied. He removed a torch from his gaberdine mac pocket, giving it to me he switched the torch on. What happened next scared the life out of me. Asking me to shine the torch on his forehead. On which was like a tattoo, but not a tattoo, a figure of a burnt cross in the centre of his forehead. I switched the torch off, hurriedly gave it him back. He said in a meaningful and distinct voice “him upstairs put that cross there”. He was gone the other way at the junction, leaving me in solitude in the dark Devon lanes, scared I was. I ran and ran, more than I ever did on the whole event. Cats-eyes on the middle of the road, kept revealing his face, a ghastly vision, with a tale to back it up, most vivid at the time. Approaching lights, I began to walk. The Lifton Ambrosia Cream Rice factory had a foyer with a doormat saying welcome on it. I stayed the night on it. I stayed till daylight, most disturbed. Sure, enough Ernest came shortly after, in his usual cheery manner, with his talk of the night before. We walked along, noticing my silence we enquired “not too good Son, not feeling well”. It all came out, all of it from “Barley Sheaf”, to the small junction. He paused for what seemed a long time, “gosh” he said, “you had a close call, some of those trustees from the Mental Hospital are right nutters, they can go anytime, they let them out for good behaviour, not concerned about general public. I paid him no heed in the pub at all, but obviously he did a job on you alright”. Felt better for talking about my scrape with the “loony bin”. 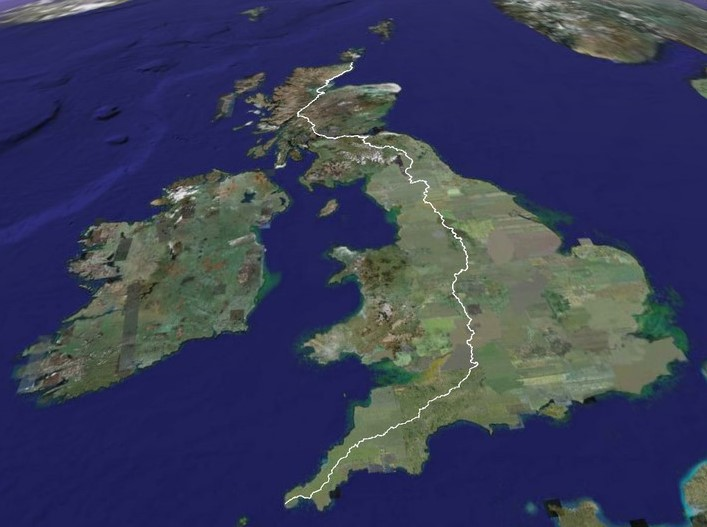 We set our direction towards Okehampton and Launceston. Cornwall beckoned us, the last County to conquer. We ate well in a roadside café. Again, Ernest showed his charm, and no charge was made. Proceeding on until darkness, strange Ernest did not stop for drink, instead he broke into a farm shed on the roadside, forcing the lock in his able way. “I will take three hours, then you take three hours”.Snoring like a pig he was asleep. To my concern vermin roamed the shed floor. Arranging myself near the shed door, pushing it ajar, I rested fitfully. Ernest yawned out of his sleep, “OK Son”. I told him I was ready for off. “Good let’sgo “, putting the lock back in an artful way. Leaving through the farm gate “Hey Hey”, it was the farmer’s wife, spotting us. I walked towards her to apologise, for our intrusion. “have you stayed all night in that shed”, “ yes Mam, not very welcoming I can tell you”, She knew full well what I had experienced. Ernest was not in a bit concerned. “you better have a bit of breakfast, tis ready on the table should you wish”. Ernest was inside and sat down in a flash. Porridge and tea, followed by a fry-up with pancakes, a tremendous meal served my two young daughters, and also sheep and lambs shared the room, with a dog, a cat, and broody old hens. A fine meal Ernest told the Farmers wife. I sensed a note of familiarity in his voice. She busied herself with extra chores. Not concerned about his well-meaning words, Ernest was re-buffed, and he knew it. He made for away. Meanwhile one of the daughters fed all the animals in the house, giving them all names as she went along. The other daughter asked me where I came from, was I local. “no around 400miles away”, “never left Okehampton”, she confessed. Admitting I had never travelled much, put her at ease, as I made for away. Both daughters saw us off, and asked me to call in anytime when in the area. Ernest winked, waved and we were on the road again. Towards Launceston, strangely first pub we came to, early doors, Ernest was in, only 11:30am in morning. I never saw him again. Back to solitude, but only 150miles from finish. I could manage that. My final random check-point at Bolventor. Gus Britton checked my cards, “Well done, see you at Lands End. Only less than 120 to finish, over 1,100 fell by the wayside, a fine effort Laddie, you may be the youngest man to finish, don’t know for sure, though, you are 101 at the moment. I had gone from under 20 to 101, and remained mobile most of the event. I had confidence in road checks, but was aware of failings could happen in a system, for a one-off event of this size. Crashing on I deliberately made a concerned effort to improve my placing. Through Jamaica Inn on Bodmin Moor. Onto the Cornish lanes pushing on, nobody in front, nobody behind, it was rather strange, to be all alone for such periods. Lanivet, Cambourne, Redruth, all came and yet no one, not a single person on the road. It was uncanny, my legs both although tired, kept in good condition, no swelling, no blisters, just a dull aching and soreness from repetitive days on the road, covering miles and miles of uncharted distance. Spying a sign that informed me of Penzance I knew this was close, putting myself whole heartedly, to cover ground as quickly as possible as I could. I made Penzance overnight. Around 10:00am, busy, busy, busy was the place. Cafes galore, hotels, tourists, boats in the scenic harbour. Although tired by my determined effort to get here, I relaxed and enjoyed the company and bustle. Looking in the quaint shops along the way out of Penzance, a mirror showed me having the need for a shave and haircut. One barber was close, and I settled in the chair. Conversation was all about the event. When he had finished, “well done number 7, no charge, you are a true End to Ender, some been in my shop, large bellies on them, giving it some welly, hard to believe they could last a day never mind 24”. “That’s life, I said, and waved him goodbye. Feeling clean and tidy I set about Lands End with relish. Penzance to Land’s End was good, people in gardens wished me well, and well done. I ran along easily arriving at Hotel Land’s End at around 4:15 in the afternoon. Gus Britton was ready to welcome me with a smart military salute. Booking in, he told me, “congratulations, you must be very proud of what you done, for tonight you will have a sleeping bag in the hotel ballroom. Breakfast is at 6am, shuttle bus leaves at 6:30am for Penzance Railway Station, your train is at 7am on the dot. You all will get an early morning call.”. Mug of tea, look around the hotel, into bed, sound asleep. Call at 5:30am, up and at them, porridge and tea, onto bus, late risers left for next shuttle. Penzance Station, goodbyes done. Ticket Office, scary moment, how much single to Manchester please, £3, phew ! !, 2pounds 7 shillings left. Boarding train, it was packed solid. Finding a seat was very hard to obtain. Still wearing my number 7 Butlin Walk, a lady allowed me to sit down, by moving her luggage to another location on the train and not on seat beside her. I nodded sat near the window and dozed off. Exeter St David’s, I awoke with severe cramp in right leg. “ouch, ouch, I said loudly”. Getting to my feet, “so sorry, I have seized up, must move”. Staring at me dubiously, I was allowed in the isle. Eventually it passed, to my relief. Coming into Bristol Temple many people got off, many seats were vacant, I was pleased. However many, many people replaced the ones that got off. Packed situation all over again. I returned to my original seat, lady beside me knew I was returning from the 1,000miles trek. She was also aware I was very uncomfortable in the squashed circumstances. On the steam train sped. Birmingham, Wolverhampton, Crewe. A space came vacant. Lady looked at me, “put your feet up laddie, while you can”. Oh, the joy. Not long now, pulling into Manchester, I shuffled off the steam train “City of York”. Through the barrier for a connection. No waiting, excellent, soon be home, for tea-time. Going to get a local bus, I just missed one. So, 4miles was nothing, off I set. About one hour later, home, how would it be. I walked straight in, “made it, made it”, I said. To my surprise, a wedding was being arranged to-morrow, all were next door, preparing for it. So, I was on my own. Do I make an entrance, with so many ladies NO CHANCE !! !, Men would be in the pub having a session. I decided to stay put and rest in peace against the fireside. A knock on the front door disturbed my peace. Local press just to see if I was home, “yes Sir, just having a break before it all goes manic, thank you. If you need anything, give me some time, please “. They moved off, saying they will return tomorrow. Just the job, back to the fireside, dozing off, back door opened. They needed more cake decorations. We had some in the kitchen. A quick rummage and they left. “Must be lucky”, I said and reclined to sleep, again poking the fire first. Well over 3 hours later they converged home, cake and cakes completed, for wedding tomorrow. “Look who’s home, look who’s home. Congratulations Son, well done, well done, when did you get home”. “Oh!,just now, have you been busy, getting ready for wedding, doing all the baking and stuff. Do you mind if I go to bed, I am shattered”. “OK, Son, off you go”. In my own single bed, I curled up and away I went to “Sandman Land”. Daylight woke me up, feeling queer, no road to cover, no destination to make. I dressed in track-suit and trainers and went out for a small run over my usual routes, it was nice, very nice, thinking I did this run as a small build up for my 1,000miles event. It had helped me. I had to cut my run short as I had to attend the wedding. Dressing up in best suit, clean shirt, tie, and shiny shoes, I felt wonderful. After the wedding, I returned to work, first thing Monday morning. Had to visit Manager, to see if I still had my job. Knocking on the door, I was greeted with “come in”, I stood still, “well Son, you have been on a long journey”. The Manager looked at me sternly, “are you ready for work”, “yes Sir”, I said. “OK, light duties for a week, then back to normal”, Manager instructed. “Will your feet stand up to regular work”, “yes Sir”, I replied, although I knew they were in no fit state for manual employment. “Good morning”, Manager said “report to timber gang for first week”. I was relieved, really happy. I feared for my job, and what would have happened at home, if I lost my job. Questions, questions, for a full week, at home, at work, local newspapers, shopkeepers, letters from interested people I had met on the 1,000miles trek. A busy period. Mum had all my County postcards, all in order, from North to South. Many, many times I read them. Looking at the scenery of recent memory. After a week normal service resumed. !!!!!! !